Week 1 was incredible. It took a 300-point outing to win the Milly Maker, a feat never accomplished before. While it’s likely unrealistic for the league to continue operating at such a high-scoring pace, there’s still plenty of fantasy-friendly games we should have on our radar this week for DFS — especially when it comes to tournaments. While the season is still fresh and new, I’m going to try something different with the format here and mix things up a little. Instead of listing a few of my favorite plays at each position, I’ll take a holistic approach at how I’m viewing the week from a tournament lens. There are a ton of running backs in great matchups at our disposal this week. Homing in on the right ones is going to be a crucial part of our process if we want to build a tight core and have a chance at taking down a GPP. James Conner’s volume – 100 percent of the Steelers’ running back snaps, carries, and targets last week — puts him in play as a player worth heavily rotating in your core. He’s a plug-and-play fill-in for Le’Veon Bell and showed last week that it’s an incredibly valuable DFS role. Take advantage of his cheap salary again this week. The Chargers travel east to a 1 p.m. game against a Bills squad that just got trounced 47-3. 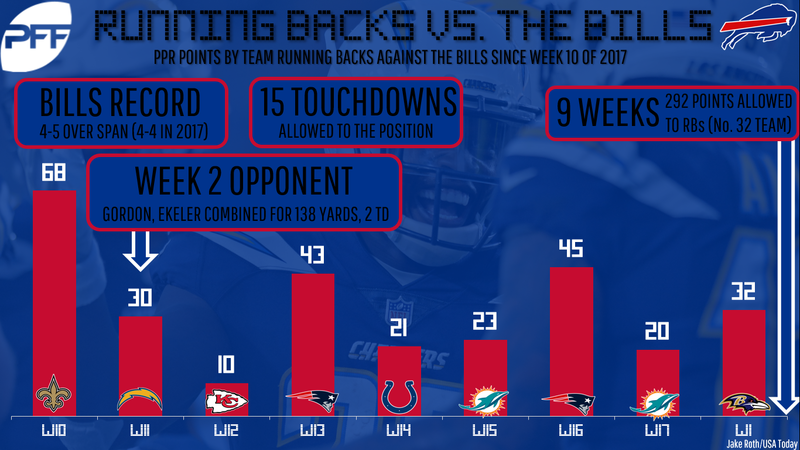 Buffalo allowed three rushing touchdowns last week to Baltimore’s running backs, and there’s a chance Melvin Gordon is able to accomplish that feat on his own this week. Gordon had 15 carries and 12 targets last week and could be in line for even more volume if his defense is able to create turnovers against the woefully inaccurate rookie, Josh Allen.